I made a fun teapot shaped card for this week's challenge at The Shabby Tea Room - 'Buttons and Bows'. This week's sponsor is The Cutting Cafe, the DT were given some templates to work with, I used one of the teapot ones! They're so cute! Not my usual color palette but I just loved the pattern of this paper from the Prima Melody Collection and there's also a bit of Prima Botanical in there. The lovely sentiment is from Afternoon Tea by Waltzingmouse Stamps. I added some little brads to pick up some of the details in the paper. Such a lovely card ... and that little charm is just the cutest thing!! Wow, what a stunning card Clare!! The tea cup charm is just so adorable and I love how you have used a button on the tea pot lid. 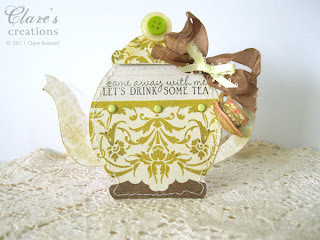 A gorgeous teapot card with beautiful colors! 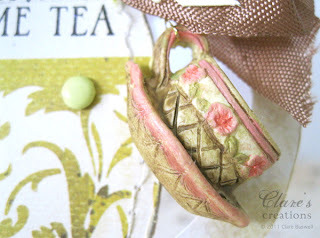 And the little teapot charm is so so cute...LOVE it!!! 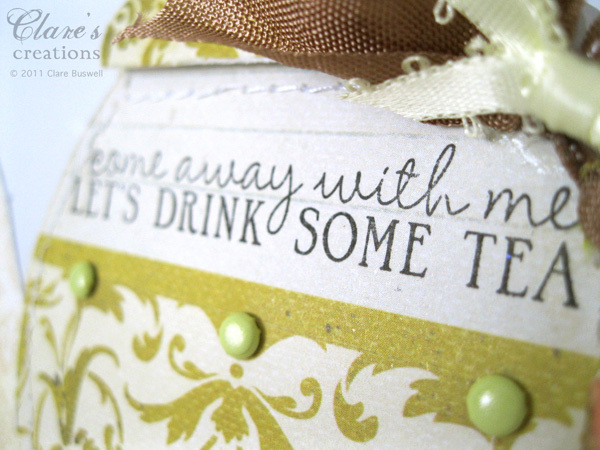 Such a beaqutiful funshaped card, love the papers and the cup charm is so sweet.